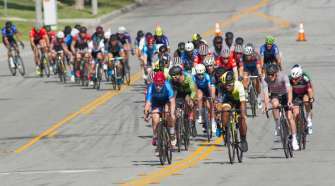 Interview with Predator Cycling's Aram Goganian - SoCalCycling.com - Southern California, Cycling, Cycling News, Amgen Tour of California, Bicycle Racing, Fun Rides, Cycling Event Schedules, Mountain Biking, Cyclocross, Cycling Photos, Cycling Videos, Interviews, Product Reviews. SoCalCycling.com caught up with Aram Goganian, owner and operator of Predator Cycling. Predator Cycling, which is located in Southern California, has been designing and manufacturing carbon fiber frames and components for the past 10 years specializing in cutting edge custom road, track and time trial bike frames and components built by hand. Predator is also a main source throughout the country for carbon repair, bike fits and other specialized services for cyclists and bike shops alike. SoCalCycling.com: How did you get into cycling and how did you get inspired to start Predator Cycling? Aram Goganian: I have always loved riding my bike for fun and in 1999 I started cycling with the AAF program at the Encino Velodrome. I had desperately wanted a TT bike, so I started designing my own. One thing led to another and I began designing and building bicycles soon after in the year 2000. SoCalCycling.com: What were some big changes for Predator Cycling for 2012? Aram Goganian: This has been a very exciting year for Predator. We launched our new website, where we offer a majority of our products as well as advertise our carbon repair service. Included on our site is a complete instructional video for customers to identify when their bikes are in need of carbon repair, how our online repair quote process works, and how they are to properly package their bikes for shipment. We have been doing carbon repair for quite sometime now, but with our newly updated website, along with intense social media marketing, we have been able to expand our service knowledge to more customers. SoCalCycling.com: How have you seen technology change in the frame and components industry? Aram Goganian: Over the past couple of years we have seen some considerable changes within the industry. There have been three big changes when it comes to frame design; ISP, BB (PF30,BB30, BB386….) and tapered steerer tubes. In material use, we have seen all kinds of improvement in carbon technology. Here at Predator, we have always pushed the limits of technology while maintaining the highest of quality in our products. We use PF30 and BB386 standards. A handful of our bikes use ISP so that we can fine tune the riding characteristics of the bikes. As for the carbon, we use the highest quality we can get our hands on. We have also started making more and more of our own tubing in-house to round out our custom repair. SoCalCycling.com: What do you see Predator Cycling specializing in: Road, Cross, MTB or Track? Aram Goganian: We specialize in Road, Track, Time Trial, and Cross bikes. We do not change our standard on any of our models. All of them are made with the same Predator standard in quality! SoCalCycling.com: When a client wants custom, how do you accommodate them for what they might be looking for in a ride? Aram Goganian: Each bicycle we build is specifically customized to the rider. If our client wants a bicycle for racing we lay up our joints and make our tubing different. If they are looking for more of a weekend road bike, we make sure it is smooth and provides easy handling on the road. We make all of our bicycles in-house here in SoCal so we have total control of what our customers need in order to accommodate their every request. 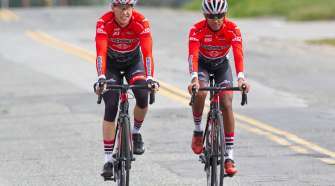 SoCalCycling.com: Living in SoCal what type of trends do you see in cycling and where do you see Predator Cycling catering to mostly to? Aram Goganian: Over the past year we have seen various frame materials used in the cycling industry. When I started racing, aluminum was the big thing while carbon was just starting to come into the picture. Steel was pretty much on its way out. Today, carbon has become mostly mainstream in the road racing world, while steel is making a comeback in the custom bike build category. At Predator, we make full carbon custom frames and components. We are always making cool new carbon products for our customers like computer mounts, number holders, and a variety of other innovative accessories. We are the carbon bike guys at Predator. We proudly cater to both cycling enthusiasts and pros alike. 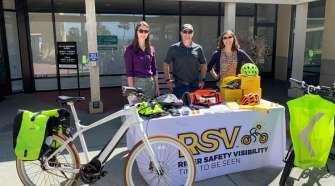 SoCalCycling.com: How has the Internet and different forms of multimedia helped Predator Cycling in the marketplace? Aram Goganian: The internet has been extremely vital for us in spreading Predator’s name and services, specifically social media and sharing platforms. Ninety percent of our marketing has been through our website (PredatorCycling.com), Facebook, Twitter and Instagram accounts. Social media has increased the speed in which we can communicate and return customer inquiries quickly. Through our Instagram posts, we share real-time visual updates of our latest products with our followers. Through our Facebook and Twitter pages, we promote all of our Predator Cycling events and provide product and shop updates to our fans. More and more, we have been using social media links to increase sales initiatives through our website. These media outlets have proven to be extremely successful for us at Predator Cycling. SoCalCycling.com: Predator Cycling is now offering carbon repair, how did this come about? Aram Goganian: I have been building custom bikes and bike components for some time now and using carbon to repair frames just made sense. This year we started heavily advertising our carbon repair service and it has proven successful for us at Predator. Since most people already know us for carbon frames on our handmade bikes and custom components, it’s not a hard stretch to offer repair services as well. Carbon Frame Cracked? | Carbon Repair Predator Cycling from Predator Cycling on Vimeo. SoCalCycling.com: It is interesting on how many of the big manufacturers don’t offer frame repair for damaged frames. Are there any programs in place to recycle carbon frames? Aram Goganian: I don’t know of any programs out there other than us that recycle carbon frames. We purchase used and damaged carbon frames and then use the spare parts when we are fixing other frames in the shop. Occasionally, we rebuild the spare parts back into a working frame. We are currently using Predator repaired carbon frames for our newly formed Predator Elite Cycling team for the upcoming 2013 season. By using our own repaired frames for our elite team, we are constantly pushing ourselves to the next level in order to maintain credibility, quality, and innovation within our industry. SoCalCycling.com: Predator Cycling will be headlining an elite road team for 2013, can you give us a sneak peek into the Team and what you have planned for next year? Aram Goganian: I would love to. We are really pumped to be having an Elite Road Cycling team next year for the 2013 season. Our team roster was released via our website in early November. We feel fortunate to have acquired some very talented and accomplished riders. The Predator Elite Cycling team will be participating in select National and International stage races next season as well as US Crit races. We will be announcing our schedule via our website upon the release of the National Racing calendar. The most gratifying part about our team is that it is fully owned and operated by us here at Predator Cycling. The team will be rocking our Predator Major bars and all of our cyclists will be riding Predator repaired carbon frames. At the Elite level, equipment often tends to take a beating. Elite cyclists are brutal on their bikes both during performance and travel. Predator bikes are guaranteed to withstand the torture of elite athletes and anything thrown at them. As a true testament to our craftsmanship and reliability we offer a lifetime warranty on all carbon repair work serviced by Predator Cycling. SoCalCycling.com: Thanks for your time Aram! Best of luck to Predator Cycling and the Predator Elite Cycling team in 2013!